This site provides information about the latest research including pages for 2,178 genes and 76 cancers and associated conditions. 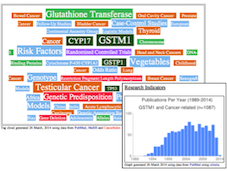 CancerGenetics Web is now integrating information from several data sources and introducing new features, such as analysis of the literature using data from PubMed and CancerIndex.org, and providing a 'living literature review' by integrating the latest research abstracts relating to genes, proteins and cancer. If you are a first time visitor please read the introduction. The site is primarily intended for health professionals and researchers. The aim of the site is to provide comprehensive links to reliable information about genes, their associated proteins, and genetic mutations associated with cancer and related disorders. Each gene page includes links to major genetic databases and where possible links to other related web sites, abstracts references, external searches, and summary information. The site is integrated with Guide to Internet Resources for Cancer to provide links to related clinical and research information sources. Please note: the site includes putative oncogenes / tumour supressor genes and proto-oncogenes implicated in cancer but for which the association with cancer is not necessarily proven. Links to other databases and research abstracts and pre-configured searches of PubMed are included to provide a gateway to available evidence and the latest research relating to specific genes and their role in cancer. Cancer GeneticsWeb is part of the Guide to Internet Resources for Cancer family of resources. Feedback: Comments and suggestions about this Web site are welcome via the CancerIndex WordPress site: Feedback Form. With regret I cannot answer individual medical queries. genes_download.txt is a simple tab delimited file containing the set of genes listed in Cancer Genetics Web. The fields include i) gene symbol (HUGO), ii) chromosomal location, iii) gene id (NLM) and iv) file name in Cancer Genetics Web. Please feel free to link to the Website.